We promise you a 100% satisfaction guarantee on your clean for carpets, rugs, fabric and leather upholstery, curtains and mattresses in Salisbury, Old Sarum, Fordingbridge, Winerslow, Wilton, Nether Hampton, Bishop Down, Porton, Over Wallop, Amesbury, Downtown, Alderbury, West Tytherley, Lockerley. We won’t clean with harsh chemicals or detergents. We use only hot water and eco-friendly solutions, disposed of down the drain. It's kind to your home, and safe for your children and pets. Our equipment is powerful but energy efficient, requiring mains power only. Excellent work done. Im more than impressed. The work he carried out was just great. Dont think I have had my carpets this clean in years. Would not use anyone else now. Highly recommended and great prices!!! Have you got a problem with a carpet, rug, sofa, leather suite, mattress or fabric upholstery that needs some professional TLC? Have the stains and the in-ground dirt and the grime pushed you to your limit? Or perhaps you want shot of some nasty lingering odours? Help is at hand if you live in Old Sarum, Fordingbridge, Winerslow, Wilton, Nether Hampton, Bishop Down, Porton, Over Wallop, Amesbury, Downtown, Alderbury, West Tytherley or Lockerley. Please check out the rest of our site to better understand who we are and what we can do for you. Customers have been loving our professional clean in and around the Salisbury area since 2008. 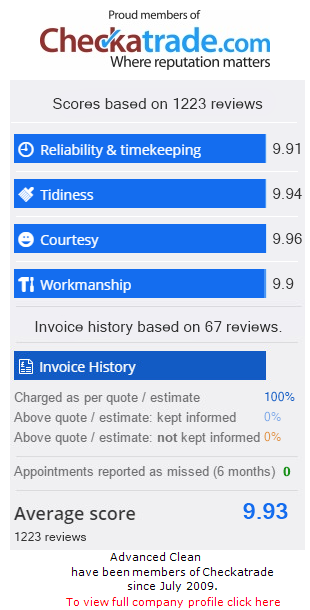 You can see a sample of what our customers say on this site or see it all on Checkatrade. We are very proud of our feedback and score. We hope to hear from you soon.